Anthony brings everything to the table in his latest release! As usual, there is incredible suspense. You are hooked from page one. His writing is like an addictive substance, once you start reading it, you’re compelled to finish. He transports you into a world of vividly depicted terror and uncertainty. Whatever you do while reading this, remember to breathe, and that it isn’t real. I say this because the superb characterizations and detailed descriptions of scenery would fool you into believing you are there among the turmoil. The depictions in this novel challenge 3D cinemas! Every sound, sight, smell, touch and thought is given high definition. Anthony crafts his stories efficiently and artistically. A fast pace and excellent flow, working hand-in-hand with larger-than-life visions. But aside from the extraordinary writing, the plot and story lines are utterly enthralling. The plot as a whole is enough to carry this book, yet Mr Melchiorri gives us much more. He includes characters with captivating back stories as he bounces from person to person, situation to situation, effortlessly. We are constantly on our toes, craving answers, eager to find out what is causing this international crisis. Anthony whittles and carves down the plot to perfection, teasing us chunk by chunk, until a mind-blowing revelation is unveiled. In a world that is obsessed with the zombie genre, Anthony brings a much fresher apocalyptic marvel to us. By the time you’re through reading this, you’ll deem zombies boring. As the author has very cleverly created a new species of antagonists, given the chilling name ‘Skulls’. Which is the appropriate name, which I am sure you’ll agree after reading ‘The Tide’. He makes zombie fiction look tired and mundane. Anthony brings more bite, and gives a reason for this book. It tells a riveting, unnerving, and disturbing tale. In short, a secret service organization is recruited to follow up on some rig out in the ocean. They stumble upon something far more terrifying than criminals or terrorists. They stumble on some type of decease that is spreading at an alarming rate. It turns otherwise rational and sane human beings into angry, rageful monsters. But if you are under the impression that this is just another book of mindless violence and senseless gore, you’d be severely wrong. The infection is just the tip of the iceberg as the secret service attempt to solve the mystery behind the biological mystery, unraveling more horror than they ever knew possible. The author clearly knows a lot about biology and science, as the scenes in labs are excellent. Anthony tells us about the infection in a very informative, yet understandable manner. The conversations between the lab technicians were superb, and had me holding my breath, beckoning for a cure to the madness. If you’re gonna read anything this October, make it ‘The Tide’! A new breed of apocalypse fiction, with fresh monsters and bucket-loads of suspense & adrenaline! 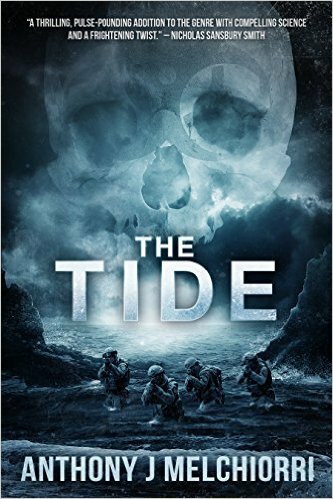 This author makes zombie fiction obsolete with his new release ‘The Tide’. A guaranteed reader-pleaser, regardless of your genre preference.